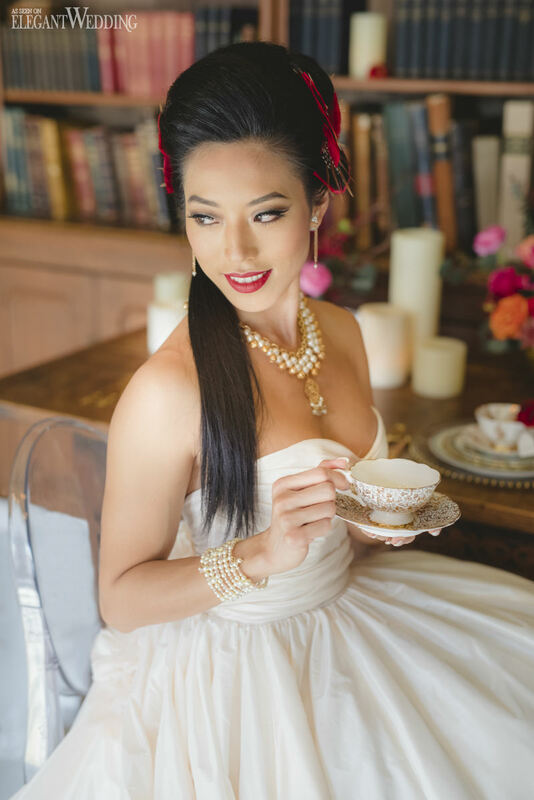 Playing on the fairytale classic Beauty & The Beast, this romantic style shoot created by Fruzsina Ford Events INC. combines the traditions of a Chinese tea ceremony with British high tea. Cleverly referred to as “Beauty & The East,” the scene uses the gorgeous Grange Library at the Art Gallery of Ontario as a backdrop. Reds and pinks were introduced in the florals by Benny & ViV to celebrate traditional Asian colours. Stationery by Post & Plume was modelled on tea bags and a three-way marriage between traditional Chinese tea, the creative artistry of origami and florals used throughout the shoot. And the cake and sweets by Cakelaine drew inspiration mostly from koi patterns and peach blossoms. Jessilynn Wong Photography captured the essence of this Asian-infused fairytale theme flawlessly.